So most of us love Italian/French food but sometimes they may be a little too costly and exotic for our likings. A simpler way to put it - we like to eat where we can pronounce the names of the food. 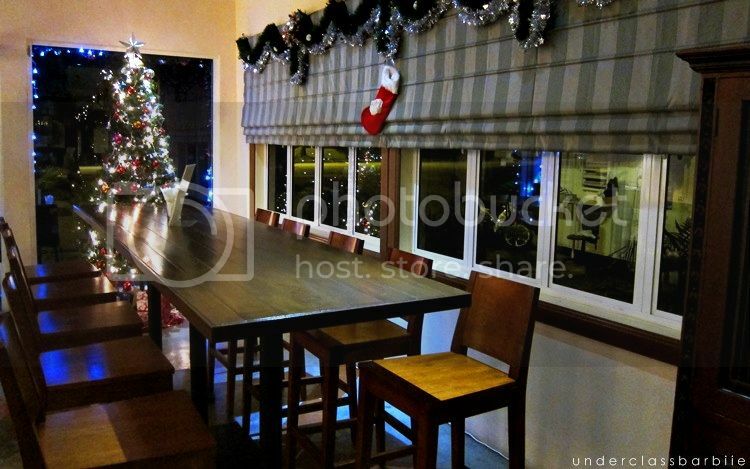 We have been led to believe that European eateries in Malaysia are overpriced and that they cater for elites only, but fortunately for you and me, restaurants like DV exists and it is conveniently located in Bukit Damansara (just behind Midvalley), where parking space is ample and the air is clean. DV Restaurant & Pizzeria is a very big deal. Everyone seems to be recommending it and food reviews submitted by gratified customers to various websites are swelling with lofty compliments and ovations. The fittings and furniture in this intimate Italian restaurant are orderly arranged. The space is wide, and the ambiance easeful. We sat back and prattled through the evening as dulcet tunes of the background music brought pleasure to our senses. Our balmy hideaway at the corner. The lineup for the evening. We were spoiled for choices the moment we sat down on. The chef was obviously being very generous. Pizza topped with tomato sauce, mozzarella and basil leaves crisped to perfection. And no, those yellowish pieces of goodness are not pineapples. Being a typical Malaysian whose main sources of pizzas are either from Pizza Hut or Domino's, this was actually my first time savoring a creamy and delicious Tartufata Pizza and I did so heartily. Also, truffles aren't exactly common in Malaysia, hence the experience was a rather enlightening one for any local dining at DV. Pizza topped with tomatos sauce, mozzarella, mushrooms and generous slices of ham. As the name suggests, this pizza is made using four types of cheeses, which choices vary from restaurants to restaurants, but this one in particular contains mozzarella, gorgonzola, parmigiano-reggiano (parmesan), and asiago. The invention of this pizza has gotta be one of the most delightful combination of bread and cheese imaginable. These are incredibly delicious. Who would have thought that minced raw beef, together with the right seasonings, can make up such an appetizing dish? Layered slices of fried eggplants with tomato sauce and mozzarella cheese. A little crispy on the outside and absolutely squashy and delicate on the inside. A must-try! God Bless Europe for all the divine cheeses they have been producing. This is another one of my favorite! This dish reminded me so much of the food I had in France and it was deja vu all over again the moment I took my first bite. The Europeans are so attentive and skillful when to comes to preparing fishes. Unlike in Malaysia, the only tunas you'll be able to find are in cans. I think I ate half of what was in this picture lol. Organic chicken scaloppine served with porcini mushrooms and parsley sauce. Probably the most practical dish in the entire menu from the perspective of a Malaysian, but still delicious nonetheless. Chicken is cooked to the right tenderness and the slices of mushrooms complemented it perfectly. You should be ashamed if you leave this restaurant without trying any of these delicious, mouth-watering desserts. Sweet they may be, but not to the extent that it sickens you. Perfetto! You could only imagine how stuffed we were at the end of the day. A modest restaurant offering a wide selection of delicious and inexpensive Italian food, run by a friendly owner and a team of helpful staffs (all which are equally as pleasant and humorous). What more can you possibly ask for? Read more reviews on DV Ristorante & Pizzeria here! Frankie Ferrarese, the man who made it all happen.